So, Why Did the Media Fail You? Broadcasting or traditional media have been studied by the uses and gratifications perspective (UGP) to uncover the reasons people use traditional media (television, radio, newspapers, even film), and as a means of understanding how the gratification of the need can result in the media affecting the user. The perspective is concerned with how an individual’s motives generate expectations of the media, which leads to certain types of media use in the hope of gratifying the initial need, while at the same time possibly resulting in other consequences. UGP is essentially an umbrella, describing a research interest, and by itself does not theorize the why’s and how’s of the relationship between the need, the user and the media. It has instead served as the paradigmatic foundation from which various media choice, use and attributes theories have sprung. While UGP has focused on creating typologies of gratifications sought and obtained, there has been less research in the paradigm as to how traditional media fails to gratify the user or the context from which the motivations to use the media arise. The purpose of this study was to investigate what led media users to be dissatisfied with their interaction with the media. Possible reasons may be found in the characteristics of the medium, its message, the situation, the situation-specific needs of the user, or some combination thereof. As this study focused on the content analysis of an already completed qualitative/quantitative interview, the main goal was to understand the perceived characteristics the users saw as the cause of their dissatisfaction. This goal was chosen to empirically and theoretically illuminate certain aspects at the core of UGP that have remained in the dark, as well as providing insight into the practical application of the mass media in everyday life. While UGP has been criticized for being atheoretical, the perspective has generated a number of theories designed to explain the relationship between an individual’s needs, their media use and the effects of this use on themselves and subsequent media interactions. Expectancy-Value Theory initially predicted that gratifications sought from the media will be influenced by the user’s evaluations, beliefs and ascribed-importance of the media, in a way very similar to how beliefs can influence behavior. Expectancy-value theorists publicize the importance of audience perceptions and reactions to the potential media sources, thereby assuming a motivated-to-act user, as a fundamental condition in the gratifications sought and obtained relationship. However, other research has found that expectations and values about a potential gratification are more of an indirect route to predicting media use than understanding the actual gratification-seeking intentions the user has within a media use situation. Also, expectancy-value theory, while discussing the importance of basing attitudes and expectations upon characteristics of the media, does not theorize what these characteristics might be. Media Richness Theory formed out of both social presence theory and information-richness theory. Social presence theory conceived of media use as determined by the degree to which it enables interpersonal interaction, while information-richness theory saw the importance on the amount and type of information in the medium’s content. Media richness theory combines these elements, describing a rich media as one that conveys multiple verbal and non-verbal cues (more diverse information), allows more immediate feedback (interaction), and has a personal focus (relevance or affective). How the user perceives the richness of the medium will impact their decision to use that medium. Niche Theory, and its subsequent research, while not addressing these limitations of expectancy-value directly, does address attributes of mass media as a means of understanding the gratification opportunities of the medium. Niche theory, as a media economics theory, states that each medium fulfills certain needs for the potential audience and to compete for that audience, digital media will have to serve those needs better or serve those needs not currently being fulfilled. Essentially, instead of examining the faults of traditional media directly, these studies compared how traditional media lacked abilities that newer media possess. Little research has been done in UGP as to what are the characteristics about the media that lead to a good relationship between the gratifications sought (GS) the gratifications obtained (GO), and much less about what leads to a poor relationship. Instead of examining the media as a mediating variable on the GS-GO relationship, more research as looked at what produces the GS, and how the GO feedbacks back into this production. In UGP research, the psychological and social reasons for the creation of motivations that in turn lead to media use has been less empirically studied. Typically, motivations have been measured in terms of personality traits and societal traits such as gender, socioeconomic status, and other demographics. There is a pre-existing theory that closely approximates the proposed model of situation, user and medium. Media Dependency Theory predicts that there is a triangular relationship between society, the media and the audience, such that the relationships between the three factors create and nurture an interdependency between the three. Dependency is described in terms of how well the relationship between the media and the audience fulfilled the audience’s needs; and in a society where individuals experience increasing alienation from each other and their society, the media play an even larger role of maintaining communication across these gulfs. Media dependency theory recognizes that there are several factors influencing an individual’s reliance on a medium and/or its content, such as the individual’s goals or needs, the context in which the individual acts and the nature of the medium and the message. This overlap then naturally leads into combining media dependency theory and UGP, as dependency discusses how social-structural factors can constrain motivation while UGP allows for a more active or voluntaristic user within that constraint. However, media dependency theory is more concerned with macrolevel social forces on an individual and the media system rather than the more immediate external constraints, such as interpersonal pressures, that may be influencing individuals in a microlevel situation. This is not to say that macrolevel social forces do not impinge upon the microlevel; only that such social forces may be diluted or otherwise modified before their effect is felt on the microlevel. Thus, from across the communication fields, there appear to be attributes of the situation and media that affect how users perceive and engage with them. The media attributes can be seen as either medium-specific (such as feedback potential and ability to access and control) or message-specific (such as amount and diversity of content as well as relevancy to the user). The situation factors could be numerous, as macro and micro interact, but as predicted by media dependency theory, uncertainty and ambiguity, or lack of perceived control, in a situation may be influential in how individuals use the media, as their expectations for what the media can do for them may be impacted by what they perceive the situation and the medium within the situation will allow. Extrinsic to the media itself is the user, whose perceptions will be influenced by their internal personality traits and motivations as well as the situational context and social factors influencing them at the time of choice. In terms of understanding how a situated user perceives the media and/or its content as helping them in the given situation, there are three dimensions to consider for predicting media use during this sort of information-seeking. First is the user; not on their sociodemographic characteristics or personality traits but their perceptions of the need, the context from which the need arose, the situation in general and the medium as a source. This perception dimension would appear to be the beginning and the end of the story. However, there is objective truths as to the characteristics of the situation and the medium that must also be taken into account, as these factors will limit the access and control the individual has in obtaining and using a medium as a source, such as time, income, location, the nature of the need, etc., and all of which can impact the perception of the user. The factors of the situation that might produce these perceptions are less understood and are thus one of the aspects investigated in this study. There are also the medium-specific characteristics unattached to the situation’s characteristics, which will impact the user’s perception but are external to both the user and the particular situation in that they are set by some outside and typically unattached third party (i.e. a network news programmer). The medium dimension can be further divided into control over the medium and the variety of message. The medium can be characterized by its control aspect, which would include how interactive it is and how accessible it is. The message can be characterized by its sufficiency aspect, which would include the depth, breadth and relevancy of the information it contains. All of these characteristics, to make the media be gratifying, depend on how the user perceives them, and often these perceptions are influenced by the situation. Not all users in any given situation will require the same level of control and sufficiency from any specific medium to judge that medium to be either a help or a hindrance. Thus the perception of the user is incredibly important in understanding this help versus hinder dimension. But there can be no doubt that such perceptions will be based upon the very objective characteristics inherent in the medium and/or its content. Here the need that prompts the media use is conceived of as being influenced by a combination of individual, situational and societal factors, which may in turn also be affected by aspects of the medium and the message. The medium and its message can also affect society, the situation and the user in other ways, which would influence the need indirectly. 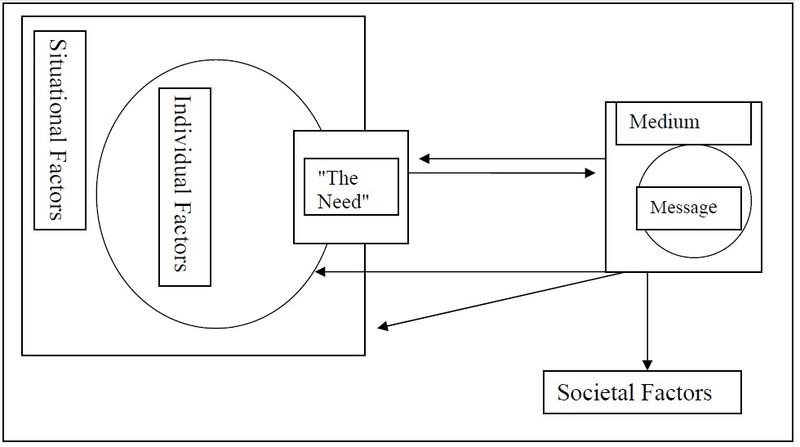 The strength of the relationship between the need and the medium, also defined as the user’s dependency on the medium, will be influenced by how the individual perceives the medium or its message as impacting the need, which would in turn be influenced by the situation and the society as the individual is nested in both. This relationship then on which UGP is founded then appears complex, but it is in complexity that the truth is known. Now, this is just a theory in need of actual empirical investigation, and it may only apply to one type of gratification, that of information-seeking. However, the possibility is that such a model of motives, use, evaluation, dependency and effects could be applied to other gratifications sought, such as interpersonal and entertainment. In any case, the need for integrating the situated user and their perceptions into their motives, use and subsequent effects of media could shed new sight into the uses and gratifications individuals have with the communication they employ.